Favorite restaurant dessert recipes found their way into the popular cookbooks of Grandma's day. Below you'll find the best desserts from America's most famous 19th century restaurants that were synonymous with fine dining. Enjoy recreating these delectable knockoff desserts from the early days of the Big Apple and the City by the Bay. Delmonico's became famous for their signature dishes and restaurant dessert recipes. It was claimed by some New Yorkers that chef Ranhofer invented Baked Alaska at the Delmonico's restaurant in 1867; however, it cannot be proven beyond a doubt. 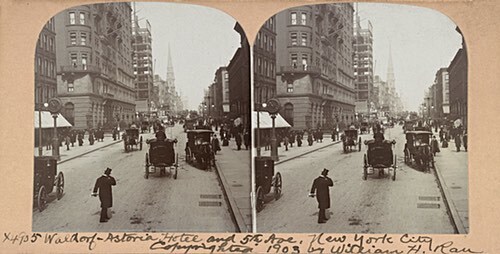 Brothers John and Peter Delmonico opened their first restaurant in 1827 at 23 William St, New York City, and they moved and expanded their business several times afterwards. 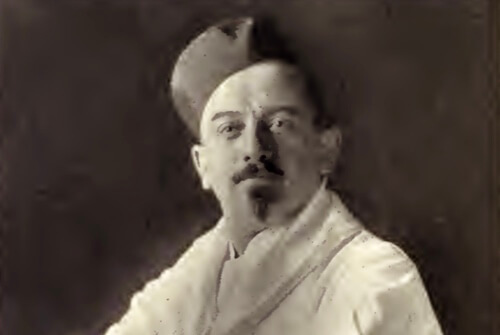 The founding family sold Delmonico's in 1919. One-half cup of butter, two cups of sugar, two teaspoonfuls of baking powder, two-thirds of a cup of sweet milk, three cups of sifted flour, the whites of eight eggs, beaten stiff. Cream the butter and sugar; add the milk; then the flour; beat thoroughly; then add the eggs; and flour, with vanilla. Bake in two layers till done. Three tablespoonfuls of cornstarch, the yolks of five eggs, six tablespoonfuls of sugar; beat the eggs light, then add the sugar and beat again till very light; mix the cornstarch with a little cold milk; mix all together and stir into one quart of milk just as it is about to boil, having added a little salt; stir it until it has thickened well; pour it into a dish for the table and place it in the oven until it will bear icing. Place over the top a layer of canned peaches or other fruit (and it improves it to mix the syrup of the fruit with the custard part); beat the whites to a stiff froth with two tablespoonfuls of white sugar to an egg; then put it into the oven until it is a light brown. This great restaurant dessert recipe makes a very delicate and delicious pudding. Two heaping teaspoons gelatine, dissolved in one-half cup cold water for one-half hour; mix this with two cups milk and a pinch of baking soda, to keep from curdling; let boil a few minutes and remove from fire; stir in yolks of four eggs, one cup sugar; boil again, stirring constantly until thick. When cool, add the beaten whites and one-half wineglass sherry. Line mold with crystallized fruits and macaroons; put on one-half quantity, then add more fruit, and then the macaroons. Set away till formed. 2 cups milk, 3/4 cup sugar, yolks 7 eggs, 1/8 teaspoon salt, 2-1/2 cups thin cream, 1 tablespoon vanilla, 1 teaspoon lemon. Make custard of milk, sugar, eggs, and salt; cool, strain, and flavor; whip cream, remove whip; there should be two quarts; add to custard, and freeze. Serve plain or with Angel Food. Angel Food: whites 3 eggs, 1/2 cup powdered sugar, 1 quart cream whip, 1-1/2 teaspoons vanilla. Beat eggs until stiff, fold in sugar, cream whip, and flavoring; line a mold with Delmonico's Ice Cream, fill with the mixture, cover, pack in salt and ice, and let stand two hours. 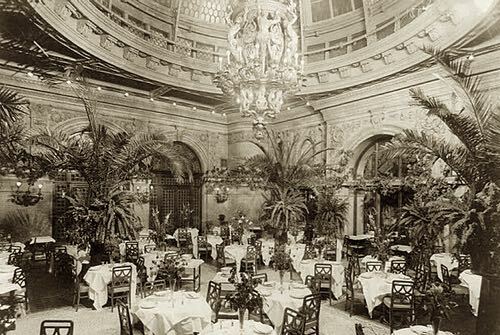 The Astor House's dining room menu offered 30 meat and fish dishes daily making it the most elegant place to dine in New York City. Its restaurant dessert recipes became sought after by chefs across America. The Astor House, some years ago, was famous for its mince pies. The chief pastry cook at that time, by request, published this great restaurant dessert recipe. I find that those who partake of it never fail to speak in laudable terms of the superior excellence of this recipe when strictly followed. Mix thoroughly, and warm it on the range until heated through. Remove from the fire and when nearly cool, stir in a pint of good brandy and one pint of Madeira wine. Put into a crock, cover it tightly and set it in a cold place where it will not freeze, but keep perfectly cold. This famous restaurant dessert recipe makes a large quantity, but will keep good all winter. —Chef de Cuisine, Astor House, N.Y.C. The Hotel St. Francis opened its doors in 1904, and it quickly earned a reputation as being one of San Francisco's finest hotels. 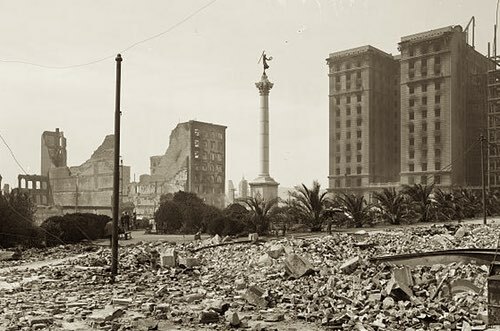 Just two years later, it withstood the 1906 San Francisco Earthquake, suffering only minor damage. Chef Victor Hirtzler brought his legendary skills to the St. Francis Hotel. He had formerly cooked for European royalty and his famous dishes drew crowds to the hotel's fine-dining restaurant. Now, you can enjoy several of the celebrated chef's most popular restaurant dessert recipes. Crush one-half pint strawberries with one-quarter pound sugar. Whip one pint of cream until stiff, then add the crushed strawberries, mix well, and serve in saucers. Raspberry, peach, or banana whipped cream can be prepared in the same manner. This restaurant dessert recipes is so easy to make and so delicious to enjoy. For two pies, line the plates with pie paste rolled very thin. Slice six good sized apples, add one-quarter of a pound of sugar and a teaspoonful of powdered cinnamon, mix and fill the plates. Wet the edges of the dough and cover with paste also rolled thin. Wash over with egg, make a few cuts in the center so the steam may escape while baking, and put in a moderate oven. When done dust with powdered sugar, and serve hot or cold as desired. If the apples are coarse, it will be well to boil them a little in water with a piece of cinnamon and a very little sugar before adding them to the pie. One and one-half pounds of flour, one-half pound of lard, one-half pound of butter, and a pinch of salt. Mix all together and add enough water (about one cup) to make a rather stiff dough. Keep in cool place or icebox. Cut "lids" from the tops of four large oranges and remove the insides. Have the openings about an inch and one-half in diameter. Fill about one-third full with some sliced fresh fruit, such as oranges, apples, bananas, pineapple, etc. Then add a few drops of maraschino, fill another third with vanilla ice cream. Beat the whites of six eggs until stiff, mixed with one-half pound of sugar and the grated rind of an orange, and fill the final third of the orange. Dust with powdered sugar, and brown on top in a very hot oven. It will take but a second to brown, and they should be served at once. One pound of sugar, one pound of flour, the yolks of five eggs, six ounces of butter, and three tablespoonfuls of thick sour milk in which has been dissolved one pinch of baking soda. Mix to a hard dough and roll very thin. Beat the whites of two eggs and use to moisten the top of the rolled dough. Cut in the desired shape, sprinkle with sugar mixed with a little powdered cinnamon and chopped almonds, put on buttered pan and bake quick. Whip a pint of rich cream until thick. Beat the yolks of four eggs with one-quarter pound of sugar, until very light. Then add it to the cream, with a pony (ounce) of maraschino. Whip the whites of five eggs very hard, and add them to the mixture, mixing lightly. Then fill fancy paper cases or small serving molds until about one inch higher that the edges, and set to freeze. When hard, and just before serving, dip the tops in grated chocolate. Make a Souffle Glacé Pavlowa mixture, dress in fancy paper cases, using a pastry bag with a fancy tube. Sprinkle some chopped pistachio nuts on top, and freeze. Take four large apples and remove the insides with a sharp spoon, leaving only a firm shell. Put a spoonful of applesauce on the bottom of the apples. Whip the whites of six eggs very hard, and mix with a half pint of sweet applesauce. Fill apples with this, dust over with powdered sugar, and bake in a moderate oven. To make this historical restaurant dessert recipe, peel and core six apples and cut in small pieces. Put into a vessel, add a pony (ounce) of white wine, two ounces of water, one ounce of sweet butter, two ounces of sugar, and a small stick of cinnamon. Cover, boil for thirty minutes, and strain through a fine sieve. 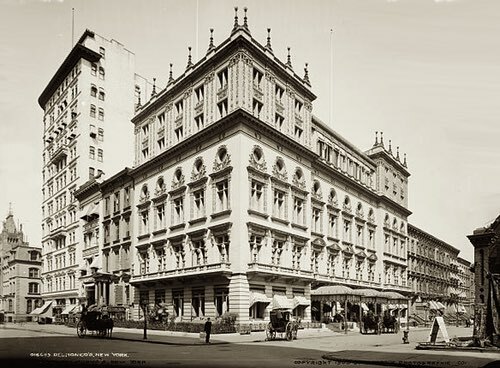 The original Waldorf Astoria Hotel was situated along Fifth Avenue in New York City and opened in 1893. It was later demolished in 1929 to make way for the building of the Empire State Building on the same site. The Waldorf Astoria became famous for its lavish dinners and glamorous charity events that attracted wealthy celebrities, and its name inspired restaurant dessert recipes like the one featured below. Miss Woods also says that the name "Waldorf Sundae" is suggested by the resemblance of the mixture to the well known "Waldorf Salad." Put a small dipperful of chocolate cream in a sundae dish and over the ice cream put a ladleful of crushed fruit syrup; over the syrup put a ladleful of whipped cream and top with broken pecan or hickory nutmeats. The syrup is made by cutting up fine one orange, a small bunch of Malaga grapes, a few Maraschino cherries, and a little crushed pineapple. Mix all together, add enough simple syrup to produce a mixture of about the same density as that of ordinary crushed fruit syrup, and enough of the juice from the Maraschino cherries to give the mixture the desired color; the syrup is then ready to serve. Mix a quart of crushed ripe strawberries with 1 pineapple, previously cut into cubes. Mix thoroughly with as much sugar as the fruit will absorb. Now add an equal quantity of ripe cherries or other fruit, and a quart of chopped pecan and pignolia nutmeats (pine nuts). Add enough strawberry syrup to bring the mixture to the right consistency and use to pour over ice cream in the preparation of sundaes.